The rapidly growing software company continues to invest in the future and set the stage for its ongoing growth. “The company has an outstanding reputation of being a great place to work and is positioning itself for exponential future growth,” said Mayor Frank Brocato, City of Hoover. 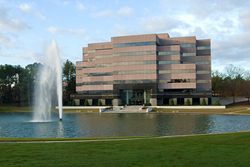 McLeod Software has purchased a 140,000-square foot office building in Hoover for its new corporate headquarters. The company plans to move into the new facility in early summer 2018 at the completion of a major remodeling project at 100 Meadow Brook Corporate Park. This building will allow the rapidly growing company to consolidate its two current office locations in the Birmingham-Hoover metropolitan area. It also sets the stage for the company’s continued growth. “One of the most rewarding opportunities McLeod Software offers our region is new jobs being transplanted from other states,” said Derrick M. Murphy, Hoover City Council, Place 5- Chairman, Commerce & Development. McLeod Software has experienced an average growth rate of 20% over each of the last six years and expects continued growth that should lead to the company doubling in size again over the next 5 years. McLeod Software has been ranked as one of Birmingham’s top two largest software development companies for 4 years in a row by the Birmingham Business Journal. “McLeod’s transition to Shelby County is a very exciting one. They are a company that stays on the cutting edge of technology with their R&D and evolving offerings for their customers, and they are at a critical growth point. Moving forward and providing them the support that they need for that growth should and will be a concerted effort among community partners like the Department of Commerce, the Birmingham Business Alliance, the City of Hoover, and 58 INC. We are here to support them in any way we can,” said Yvonne Murray, Managing Director, 58 INC.
McLeod Software was established in Birmingham over 30 years ago. With nearly 900 customers in the U.S. and Canada, the company is the leading provider of complete enterprise management software solutions for the transportation industry. Colliers International assisted McLeod Software in the transaction. Transportation companies that work with McLeod Software find the best ways to improve customer service levels and operating ratios, attract and retain the best drivers, and drive automation to destroy inefficiency. McLeod Software is the leading provider of transportation dispatch, accounting, operations and brokerage management software, and document management systems. Specifically developed for the transportation industry, McLeod Software's advanced management solutions and services enable trucking companies and brokerage firms to increase their efficiencies while reducing costs. Visit us at http://www.McLeodSoftware.com.